Stock status is current as of 1/23/2019 4:50 PMET. Price: $8999 Free shipping Today! With the Seagate?Backup Plus Slim Portable Hard Drive you get a terabyte hard drive capacity in a beautiful portable design. Made from durable metal, the drive easily slides into your pocket, purse or briefcase to take with you. While the outside metal enclosure protects the drive, the software inside protects your most precious files. Using the Protect function on the Seagate Dashboard you can set up a one-click plan or schedule your automatic local backup. The Protect feature isn't the only attribute that will attempt to ensure your files are never lost again. With the Save feature even your social media networks could be back up. The Seagate Dashboard would automatically save any content posted, even photos that you are tagged in, so accidentally deleting a photo from your mobile device might not be a problem. Whether you plan on using the hard drive for personal or business use, you get top of the line performance. With a very fast USB 3.0 interface, it is also USB 2.0 backward compatible if your destination doesn't provide for the 3.0 port. By simply downloading the pre-loaded NTFS driver you can use the drive interchangeably between PC and Mac?interfaces. 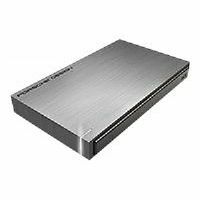 This drive is the perfect portable backup solution so get the Seagate?Backup Plus Slim Portable Hard Drive today!